POWELL, William “Bill” J. 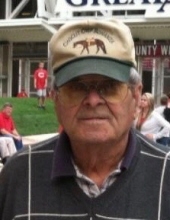 86, of South Vienna, passed away in his home on February 5, 2019 following a brief illness. He was born on August 15, 1932, in Springfield to George and Stella (Massie) Powell. He was one of eleven children. Known on the streets of South Vienna by “Knucklehead,” you could find him cruising down Old Columbus Road in his yellow Chevy s10, holding up nine cars in traffic. He loved his family almost as much as he loved farming and searching for a great deal at a farm auction. He always said he would die before he paid full price for anything, I guess that manure spreader will have to wait. In his spare time, he became quite the story teller to keep his grandchildren and great grandchildren in line. Creating characters such as ‘Sack Man’ and ‘Fast Fairy’, you never knew when or where they would appear. He is survived by two children, Greg Powell and Randy Powell of South Vienna; grandchildren, Ashley Powell, Trent (Sherri) Powell, Brittany (Ian) Cooke, Bailey Powell; great grandchildren, Colton, Austin, Owen, Amelia and Tanner. Also surviving is his brother, David (Christine) Powell of Indiana; many nieces, nephews and cousins; and special friend, Connie Shelton Powell of South Vienna. He is preceded in death by his parents; nine brothers and sisters, Ray, Ralph, Robert, Earl, Eugene, Gertrude, Freda, Roselee and Judy, and his former wife, Norma (Burks) Powell. To send flowers or a remembrance gift to the family of James "Bill" Powell, please visit our Tribute Store. "Email Address" would like to share the life celebration of James "Bill" Powell. Click on the "link" to go to share a favorite memory or leave a condolence message for the family.